Fully automated gravity aluminium injection line. Solution designed, manufactured and installed by Iruña Automation. Gantry working with 3 robots and 6 stations. This line is one of the last supplies that Iruña has made. Both the design, manufacturing, assembly and commissioning has been carried out by Iruña. 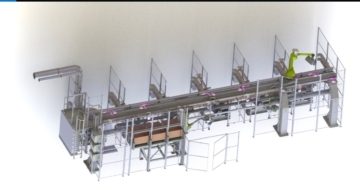 In this fully automated line we can see a gantry working with three robots. There are 2 robots working underneath and one robot working on the gantry. The 2 robots underneath have a spoon as a gripper. The broth is poured on the spoon. Each of these robots works with 3 stations.When the spoon is filled up the robot pours the broth to one of the frame /make up machine. When the cycle in the frame is finished the robot that works on the top extracts the part and puts it in the output station. Once the cycle in the gantry is finished there is a cooling tunnel and a deburring cell.